The Washington Post took the lead with the article “Trump Ends Covert CIA Program to Arm Anti-Assad Rebels in Syria, a Move Sought by Moscow,” which framed the development almost entirely as a concession to the Kremlin. It cited Charles Lister, a hawkish analyst who has for years lobbied for US-led regime change in Syria. “We are falling into a Russian trap,” lamented Lister, who works for think tanks funded by the US, Saudi Arabia, Qatar and the UAE, and never fails to toe the line. 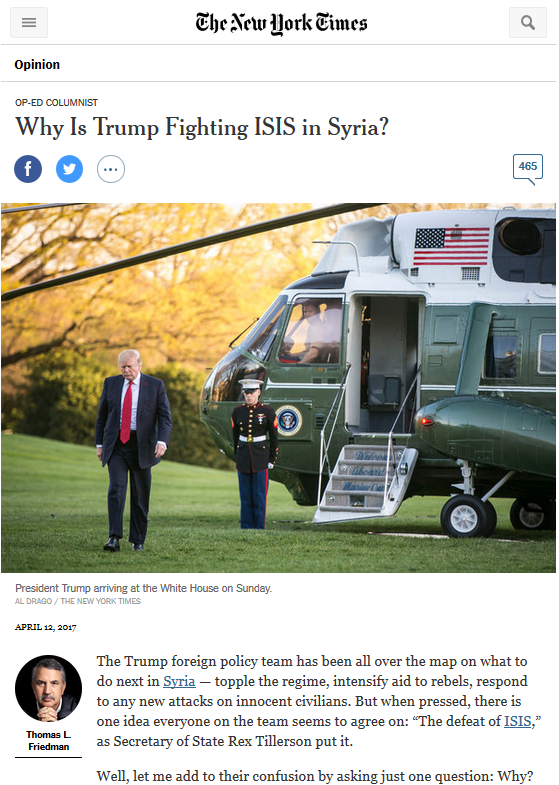 Western corporate media compliantly echoed the Post‘s talking points: The Guardian declared “Donald Trump Drops CIA Program in Syria ‘in Bid to Improve Russia Ties‘”; USA Today said, “Trump’s Cutoff of Aid to Syrian Rebels Marks Victory for Assad, Russia and Iran”; “Donald Trump Ends Covert CIA Aid to Syrian Rebels in ‘Win’ for Russia,” the Telegraph added. For once, think tanks offered a rare voice of reason. Writing for the Century Foundation, centrist analyst Sam Heller noted the halting of the program was “a concession to reality,” given it had for years been “indirectly feeding the Nusra Front”—Syrian Al Qaeda. 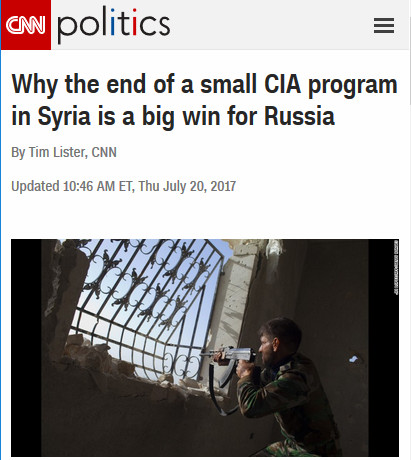 CNN declared “the End of a Small CIA Program in Syria Is a Big Win for Russia,” which compounded the distortion by labeling the rebel support “small”; Timber Sycamore, the official name of the CIA operation for arming and training Syrian rebels, was one of the agency’s biggest. It spanned multiple countries, and involved billions of dollars, from the coffers of not just the US, but also of Saudi Arabia, Qatar and Turkey. Officially, the CIA operations began in 2013, but in reality they started in 2012 at the latest. These histrionic lamentations for a catastrophic CIA operation that fueled Al Qaeda may perhaps come as no surprise, nevertheless, when one considers bloviating New York Times columnist Thomas Friedman, just several few weeks before, outlandishly proposed that the US should stop fighting ISIS and instead “dramatically increase our military aid to anti-Assad rebels,” despite the leading role of Al Qaeda in the opposition, in order to weaken the Syrian government and its allies Iran, Russia and Hezbollah. US government documents and emails from former secretary of state Hillary Clinton have acknowledged that US proxies Saudi Arabia and Qatar did just that, supporting ISIS in its early days, to little public protest from Washington. This work by FAIR licensed under a Creative Commons Attribution-NonCommercial-ShareAlike 3.0 International License.